On SW2 create two loopbacks and configure IP addresses as shown below. Configure OSPF area 28 in such a way, that R2 does not allow external prefixes but allows SW2 redistribute two new loopbacks into OSPF as external LSAs (SW2 is becoming ASBR). Ensure that routers in area 28 do have connectivity to all external prefixes already advertised. What kind of solution can solve the problem? What is a potential pitfall using this solution? In order to match the area a quick jump to R2. R2 is ABR in area 28. While configuring NSSA area, ABR does NOT inject the default route by default. This way, all routers in area 28 (SW2) would not be able to reach other prefixes that area external ones redistributed in OSPF domain outside area 28. Thus, the area 28 nssa default-information-originate command on R2. Pic. 2 - LSA Type 7 on SW2 (NSSA). Pic. 3 - SW2 NSSA 7 Converted to LSA5 in Area 0. 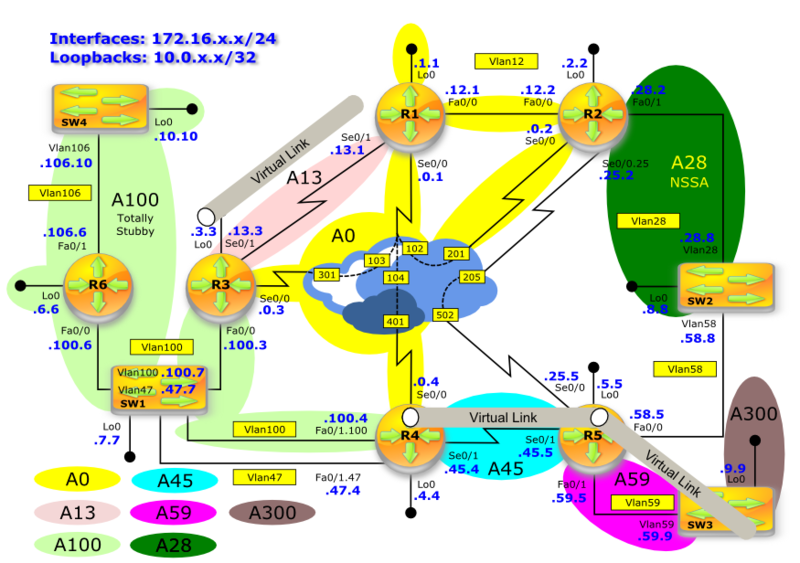 OSPF Not-So-Stubby Area allows filtering LSA 5 but allows a presence of ASBR. The difference is that ASBR introduces external prefixes as LSA 7 (NSSA). ABR converts them into LSA 5 while introducing them into area 0.